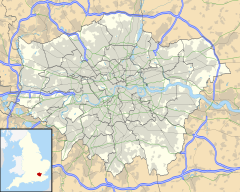 Hackney is a district in East London, England and is the administrative centre of the London Borough of Hackney, forming around two thirds of the area of the modern London Borough to which it gives its name. It was historically was in the county of Middlesex until 1900, and is 4 miles (6.4 km) northeast of Charing Cross and is in East End, it is identified as a major district centre in the London Plan. Although Hackney in the London Borough of Hackney, its southeastern and southern ends partly falls under the London Borough of Tower Hamlets. Hackney includes the sub-districts of Hackney Central, Hackney Wick, South Hackney, and West Hackney. Hackney was an administrative unit with consistent boundaries from the early Middle Ages to the creation of the larger modern borough in 1965. Hackney was based for many centuries on the Ancient Parish of Hackney, the largest in Middlesex. Parishes in Middlesex were grouped into Hundreds, with Hackney part of Ossulstone Hundred. Rapid Population growth around London saw the Hundred split into several 'Divisions' during the 1600s, with Hackney part of the Tower Division (aka Tower Hamlets). The Tower Division was noteworthy in that the men of the area owed military service to the Tower of London - and had done even before the creation of the Division. The London Government Act 1899 converted the parishes into Metropolitan Boroughs based on the same boundaries, sometimes with minor rationalisations. In 1965, Hackney merged with Shoreditch and Stoke Newington to form the new London Borough of Hackney. Victoria Park and southern Hackney Wick areas were never part of any Hackney administrative unit, instead Victoria Park being part of the Metropolitan Borough of Bethnal Green, which half of Hackney Wick was part of Borough of Poplar. Both Poplar and Bethnal merged into the London Borough of Tower Hamlets in 1965. The outline of Hackney's traditional boundary resembles a right-angled triangle with the right-angle in the SW and the Lower Lea Valley, running NW-SE forming the hypotenuse. The western boundary is based on the N-S axis of the Roman A10, though the sub-district of De Beauvoir Town lies beyond it, as do small areas of Dalston and Stamford Hill. The district’s southern boundary in follows the Regents Canal-Hertford Union Canal in part, and for the remainder marches a little to the north of it, with Victoria Park also forming part of the southern boundary. The highest points around Stamford Hill and Clapton Common are over 30m AOD, with the lowest areas being along the River Lea. The Hackney Brook was the largest natural internal watercourse, entering Hackney in the NW, at the foot of the southern foot of Stamford Hill and exiting in the south-east, however this watercourse was fully culverted in the 19th century. Hackney is served by London Overground at Hackney Central railway station, and it is named after the central area of Hackney, as well as Hackney Downs. Central was open by the North London Railway opened as Hackney on 26 September 1850, to the east of Mare Street. It closed on 1 December 1870 and was replaced the same day by a station to the west of Mare Street, designed by Edwin Henry Horne and also named Hackney. This station passed in due course to the London and North Western Railway and later on to the London, Midland and Scottish Railway, which closed the entire North London Line east of Dalston Junction to passenger traffic in 1944. Downs was opened on 27 May 1872 when the Great Eastern Railway opened the first part of its new line from Enfield Town to Stoke Newington. A pedestrian link between Hackney Downs and Hackney Central stations was opened in 2015 by LOROL. Until Hackney Central's closure in 1944, a passenger connection had linked the two stations. However, when Hackney Central re-opened in 1985, the footway was not reinstated and passengers transferring between the two stations were obliged to leave one and walk along the street to the other, until the link was rebuilt. Hackney Wick opened on 12 May 1980 by British Rail on the re-routed line which bypassed the site of the former Victoria Park station as part of the CrossTown Link line. In 1872, London Fields railway station was opened by the Great Eastern Railway. It closed in 1981 due to a fire, repairs were eventually carried out and the station reopened in 1986. In February 2006, a Docklands Light Railway (DLR) report called Horizon 2020 was commissioned, which suggested that the DLR be extended to Hackney Central from Bow Church via Old Ford and Homerton, taking over the old parts of the North London Line to link up with Poplar and Canary Wharf. Hackney is served by a large number of London Buses routes, 26, 30, 38, 48, 55, 56, 106, 236, 242, 253, 254, 276, 277, 388, 394, 339, 425 and 488 as well as the D6, and W15. Hackney is also served by the London night bus network with routes N26, N38, N55 and N253 all running in the area. Route N277 also serves here when the 277 route was withdrawn between Dalston and Highbury Corner and the N277 was retained. ^ "Stoke Newington: Local government | British History Online". www.british-history.ac.uk. Retrieved 7 October 2018. ^ Brown, Joe (2009). London Railway Atlas. Hersham: Ian Allan. ISBN 978-0-7110-3397-9. ^ Vyas, Shekha. "New bridge to cut commute between Hackney Downs and Central". Hackney Gazette.